Monster Energy Supercross has finally come all the way east, and with this trip comes the kind of dirt and traction the riders have been looking for. It's not old school mega soft rutted track red clay here in the Georgia Dome, but it's still much softer than last week's race in Dallas, which became the standard "goat trail" with one main, baked in race line. Here, by the end of the first group in practice, ruts had formed in a few turns. Other spots, though, are dry and look pretty slick, but as a whole it's tackier than most of the tracks so far this year. There's also a unique double that goes across the start straight--it's about the distance of a regular SX triple but there isn't a jump in the middle. It was tough to jump early in practice but eventually most of the riders got it down. Now that the first practice sessions are over, they're knocking the landing of that big double down a bit to make it more forgiving. So far the whoops are holding up, though. In a word, the Atlanta track is tough. The softer dirt is leading to ruts—not as deep as the old days of Atlanta but certainly more so than previous weeks of racing this year (sans Oakland). The track features some tricky jumps, two tough whoop sections and 6 180-degree turns. It looks pretty taxing, too, some of the jump takeoffs look steep and the whoops are just so tough—spaced very far apart. Guys will be huffing and puffing when this is over. Well, maybe not James Stewart. The lap times say he was fastest, but more than that, he looked smoothest. Everyone else was having herky jerky moments out there or bobbling, or just fighting the track in spots. James looked like he was on cruise control (while also logging the fastest laps). Late in the final session, he busted out a new jump for good measure, tripling off of an on-off tabletop. Everyone else is doubling. Could be a prime passing spot for Stewart tonight--he’s just on a roll right now and that could be very dangerous for the rest of the 450 field. On the other end, and off day through practice for Ryan Villopoto, who was sixth and seventh in the two timed sessions. He might have grabbed a better lap at the very end of the final practice but yellow flags came out due to a crash, and RV had to slow it down. Either way, he didn’t look as good as usual—we’ll see if he can turn it all around come showtime. The whoops are a huge separator here and if Stewart is best through them, Justin Brayton is second best, and it showed with the second best lap time in the final session. The corner before the whoops is key, and Brayton is getting a good drive from the middle of the turn to carry a lot of speed. The corner is rutted and most riders are just going all the way to the outside to get a drive—Brayton is able to do it from the middle yet still stay on top of the whoops. 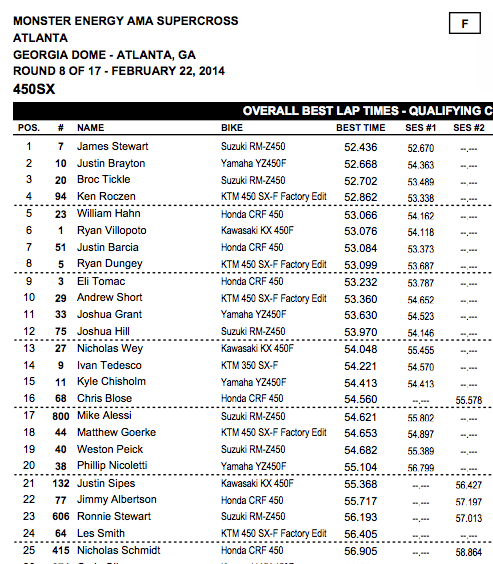 Other riders to watch include Wil Hahn and Broc Tickle, who were near the front on lap times all day long. The whoops tell the story here again: these two were fast through them, and it was reflected in their times. One other rider to consider is Justin Barcia, who was up there with Stewart on lap times early until he had a BIG crash in the whoops. He got back up and rode again but couldn’t deliver another big heater. If Barcia can get the speed back that he had before that crash, he’ll be a contender tonight. 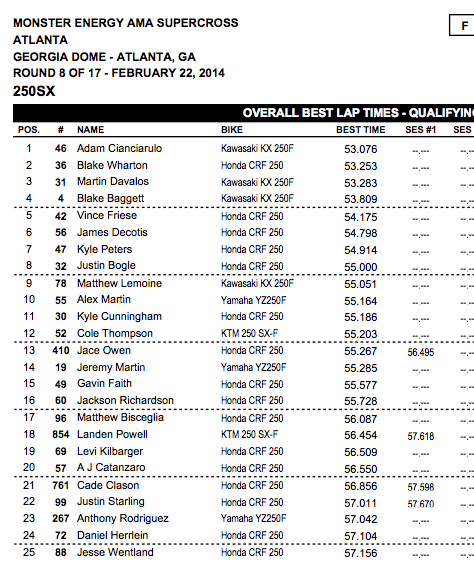 In the 250 class, rookie Adam Cianciarulo did it again, logging the fastest lap overall. But Pro Circuit’s dominance could be threatened by Blake Wharton, who was on it all day and mixing it up for top time with the Kawi boys. Wharton looked much more aggressive and sharp than he did in Dallas. Also watch for privateers Jimmy Decotis and Vince Friese who were fifth and sixth fastest.